Tanren-bo Training - The Secret of the forging stick. Every warrior culture has used both their body and a range of external devices to develop and condition themselves through tanren. In olden days it was as simple as carrying a large wooden log, giving rise to unusual activities such as caber toss of Scotland. To this day I know special forces units that train by making you a lift and run with felled trees. Kongoken - a large iron ring that was flipped and struck the arms and body to develop strength and condition against impact. and Chi Ishi - something I'll discuss in detail later. These are strengthening stones. Large rocks with handles that could be gripped with one hand or two. For the samurai THE strengthening device was the tanren-bō, literally meaning "forging stick". It is a traditional training device found in the old Japanese Schools of swordsmanship. It is heavy. It is unwieldy and is one of the most important and overlooked methods of training. Very few people outside of the koryu (very old) schools of swordsmanship are familiar with the tanren-bō , yet it is this training tool, more than any other in the arsenal of the samurai that developed the strength of these incredible warriors. 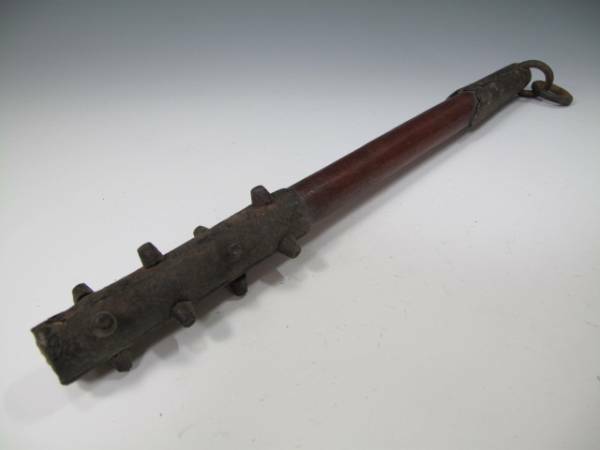 The tanren-bo is derived from the use of the Kanabō, (pictured right), a vicious club weapon constructed out of heavy wood, or made entirely from iron, with iron spikes or studs on one end used by the samurai. The Kanabō type weapons came in all sizes and shapes with the largest ones being as tall as a man and a two-handed weapon while the smaller lighter ones were primarily one-handed and the length of a forearm. The shape could be that of a baseball bat with a thick heavy end tapering towards a slender handle or they could be straight all the way from the handle to the end, with the shaft being round or multi faceted. It was most used to smash enemies' armour, bones and the legs of their warhorses. The art of using this cumbersome weapon, kanabō-jutsu or tetsubo-jutsu,consisted of a mastery of both balance and strength; it required great skill to recover from a miss with the heavy club, which could leave a wielder open to a counter-attack. Every exercise in this program teaches the effective use of this weapon. The kanabō was also a mythical weapon, often used in tales by oni (Japanese demon) since they were reputedly extremely strong. Even today there is a saying in Japanese: "Like giving a kanabō to an oni", meaning means to give an extra advantage to someone who already has the advantage (the strong made stronger). But training with the kanabō and its heavier training tool the tanren-bō also developed this otherworldly demon like strength. Shoulder flexibility and strengthening are by far the biggest advantage of this type of training. As you may already be aware, your shoulder sits on a socket with a range of motion options. Unfortunately, many of the common strength training exercises which target the shoulders such as the shoulder press only make use of a limited range of moves. The tanren-bō serves to help make sure that you properly work your shoulders by using its complete range of motion options which in turn enhances complete shoulder flexibility and strength. Simply put, if you are involved in any kind of sport that calls for flexible shoulders or elbows such as baseball, tennis and martial arts then you definitely stand to benefit from engaging in tanren-bo training. Over 20 of the Exact Specialized Exercises Used by the Samurai that I teach in the dojo today. Over 20 specific Laser Targeted Isometric Exercises.